Box plants under two pronged attack – how to cope? Box shrubs – the stalwart of English country gardens, also much beloved of city dwellers, used in borders, containers and terraces everywhere to impart a little gravitas and a great deal of evergreen structure – are under threat. We have known about box blight for some years now, but have been lucky enough to escape the worst in our corner of London. 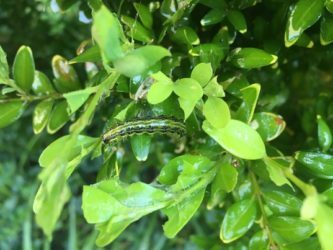 But now we have become Home To The Boxwood Caterpillar. In the past month or so, I have seen box shrubs utterly decimated by the wretched creatures, that feed on every green particle and leave a mass of brown twiggy apology for a plant, held together by webbing. In recent years, we have stopped specifying box altogether. However, it is growing in many gardens that we have created in the past. 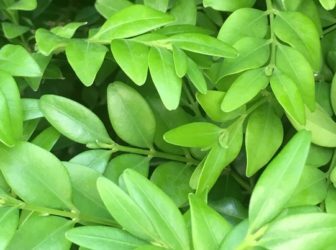 We tend to garden organically but have been recommending Top Buxus Health-Mix to our clients as a preventative measure against succumbing to blight. One head gardener whose very extensive box hedging had suffered badly, recommended tomato feed as a general tonic for blighted box. So there are products out there to help with blight issues. Prevention is better than cure, as always. But for owners of already existing box now falling prey to the caterpillar, we have recently discovered the oddly named Xentari and are just testing it now – apparently it targets just those insects and is harmless to beneficial insects such as bees, which is a big plus. Other insecticides are also effective but may kill a wider range of insects, not always a good thing. Both are found easily on the internet and are easy to apply. Hopefully your box will recover and regrow new healthy shoots – but if you’re fed up with it, there are quite a few alternatives which we’ll cover soon in a future blog.